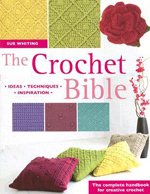 We have a copy of The Crochet Bible to giveaway! Big thanks to Tina, a Crochet Spot reader who accidentally bought an extra copy and thought a fellow Crochet Spot reader might like it. What a great way to give back to the crochet community! Leave a comment on this post describing a random act of kindness that you have performed. Like Tina, it can be crochet related, but it doesn’t have to be. Please leave only 1 comment on this post, duplicated comments will be deleted along with comments that are not on topic. Giveaway ends on Thursday, February 10, 2011 at 11:59PM EST, where a winner will be randomly selected. If you would like to learn more about Tina, feel free to visit Tina’s knit and crochet website. If you would like to lean more about the book, you can vist Amazon where you can look inside the book and flip thought the first few pages. P.S. The giveaway is for The Crochet Bible, not the Crochet Stitch Bible as I first wrote (silly me). All in all, they are both great books!! This entry was posted on Thursday, February 3rd, 2011 at 11:05 AM by Rachel Choi	and is filed under News. You can follow any responses to this entry through the RSS 2.0 feed. Both comments and pings are currently closed. Hmmm. Several years ago I began volunteering for a charity group based out of PA. I donate items to them routinely, so I guess I can’t call that random. Recently I crocheted a couple of scarves for the 2011 Special Olympics for NC, and I’ve recently signed up to send squares to a fellow crocheter in Australia who began “Crochet a Rainbow”. She’s putting the squares together into afghans for the recent victims affected by the horrendous floods in Australia. As I find myself observing different situations, sometimes I feel led to reach out and acknowledge that someone might benefit from my kind actions, words, personal experiences, etc. Recently in church I had 2 opportunities: the lady who has a grandchild facing a serious surgery – I offered a hug, and an ear – especially since I went through something similar with my son and the last of my cash went into a love offering for a member who has found himself homeless recently. Random acts of kindness – no matter how small they might seem at the time – could mean the world of difference to the recipient. I try to always keep that in mind every day; to remember that I am blessed, and the same thing could happen to me in the blink of an eye. I work for a non-profit org that helps children with learning disabilities…specifically dyslexia. I recently had a family tell me they needed to stop coming because they just couldn’t pay for the help their son needs anymore. I told them that if they couldn’t pay they didn’t need to, that I would tutor their son for free. I truly believe that without this help their son will feel defeated for his whole life and that is not something I can live with. Everyone deserves the chance to be able to read and write. Several years ago I underwent lung surgery and then chemo. Naturally I lost my hair. Using fun fur I made myself a “fuzzy hair hat” which everyone loved. Sice then I’ve been making lots of “hair hats” and leave them on the counter at the chemo joint — I also donate them to the church’s Christmas Angel project. Tutoring a young woman who’s family had her and the school systems convinced she was mentally retarded and bipolar. She was moved once or twice a year for all of her school years. The family settled in my area. She’s been at the same school for more than a year and has been attending my church. She was getting disability, but turning 18, so the grandmother that had custody of her ditched her. It’s since been found out that she is neither mentally retarded nor bipolar, just social backwards and behind in school from being kept at home or in special ed classes with children whom WERE developmentally delayed – that’s all she’s ever seen, and when grandma was out of the picture, she’s not having “mood swings”. A group of us have been trying to help her so she can graduate this year. Since I homeschooled my own kids whom have learning differences, I have the materials and skills to be one of the people that works with her to help her catch up with her peer group. Last winter we had a blizzard that dropped over three feet of snow on us. Throughout the storm our elderly neighbor would come over with his snowblower to give us a hand with the snow removal (we do not have a snow blower). In the spring we all started clean up of all of the trees and yards. We went to our neighbors with our chainsaw and removed branches and debris from his yard. He was so thankkful because he was going to pay someone to do it because he couldn’t. On Sunday, we delivered a box of groceries to a church family in need. They are experiencing financial hardship and health issues for the Dad and the daughter. We donated among other things 2 dozen farm fresh eggs from our free range chickens and Frozen chicken from my 14 year old Son’s Broiler Chicken Venture this past Summer. They were overjoyed! Such a good feeling! We love to serve people for God. I wouldn’t normally brag about such an act of kindness as this but, I sure could use this book. I am self taught and need all the help I can get, LOL! God Bless! I recently experienced a random act of kindness that was given to me. I unknowingly left my keys in the women’s bathroom at a very busy store & some kind-hearted person turned them in to the service desk for me! I try to help others as often as I can but never expected someone to give such a huge favor for me! What a blessing & such a relief! I am involved in Project Linus. Plus am trying to use up yarn by making hats. We are having a cold snap (who isn’t) so I took a bunch to my county’s human services department. My friend, who coaches my daughters cheer squad was facing the 1 yr anniversary of her 2 yr old passing away, on the same day as the girls’ last competition. I crocheted her an angel doll that resembled her sweet angel and she carried it with her to that last competition. She used it to help share the loss with the girls as well as celebrate her daughters short life. I was glad I could use crochet to give her a token to remind get that the baby was not forgotten. One night while at the emergency room with my daughter, I overheard an elderly lady speaking with her granddaughter who was ill. They were trying to figure out how they would get home when they left the hospital. They had taken a bus there but in our town the buses do not run after certain hours. They had enough money to take the bus in the morning and were going to have to wait at the hospital all night. I gave the lady the last $10 I had so that they could take a taxi home. I will never forget her gratitude and the feeling that it gave me! It was better than any gift I have ever gotten myself! This last Australia Day (I’m Australian) we went to Glenelg for the day with some visiting English relatives and arrived at a car park only to find it very full. As we slowly started driving in an older couple caught our attention to show us they were leaving. Not only did they hold up the other cars for us as they backed out of the park so we would get it, they also gave us their validated car park ticket so we didn’t have to pay for the rest of the day. Our random act of kindness was to pay it forward, as we were leaving we noticed a young lady going to pay for a ticket for her parking, so we passed on our ticket to her. My daughter and I moved from California to Idaho last July. She started a new school…tiny…from a high school with over 3,000 students to a hs with 70 students total. She makes friends easily and came home with stories that just broke my heart. She got to know kids her own age (16) who have horrendous home lives and kids who have never been anywhere but their hometown. She befriended one boy whose home we drive by everyday. He lives in a mobile home and we noticed last summer the home didn’t have a front door…they had hung a sleeping bag in the doorway. Fall came…still no door. Winter…no door. Several feet of snow on the ground…no door. My daughter told me the student had asked the teacher during her woodshop class if he could build a door for his family home. The teacher said they didn’t have enough wood for that. Other kids were making frames and small shelves as their project…he wanted to build a door. I found a door on a remodel project two towns away, asked if I could have it and donated it to the school…well, we put it in the parking lot outside the woodshop late one night. A few days later…the home had a door. I Just Recently Completed A Baby Afghan For A Close Friend Of Mine Who Just Became An Auntie For The Second Time. Little Angelina Arrived In Conn. Last Week.Needless To Say The New Aunt Is Delighted.I”ve Never Laid Eyes On Either Person, But My Heart Told Me,Crochet This New Little Girl Something Nice. I have a grand son that was dignosed with LCH 3 at the age of 14 months, this is a silent killer children are born with it and anyone can get it at any given time or age. he has vision problem so we have been to eye doctors and they are trying him on glasses, over 60,000 miles we have been for hospital and doctor visits, he is 2 now and goes for CT and MrI’s ever 3 months Praise GOD that they have not seen any tumors or lesions in 9 months. this has been my good deed not only him but I have others that have has medical issues and I’v stood by them as well. God Bless everyone and have a blessed day. I had stopped crocheting due to two car accidents and after about 15 years picked it back up again, I have made a poncho and matching hat for my granddaughter and after posting pics to some friends of mine, and them commenting on how nice it looked I have offered to make winter hats for some of them. As well, our family doc is one of the last in our area who also still delivers babies, I had an idea to make little sets of caps and sweaters and booties that she can give to those who are not as well off and wanted something special to bring their baby home in. i usually do not tell what i have done. keeping it secret is what i enjoy the most about giving. i have done some ‘ding dong ditch’ with gifts and donated to homeless shelters and women’s housing whom were abused. young mother’s with need of items for themselves and children. when i hear of the need i try to complete. each christmas there is a charity in my area and a friend of mine and i work to add. i keep a stash of items for gifts which always comes in handy for that last minute need. this may not be the email which causes lights bells and whistles to go off to win the amazing crochet bible. I make jewelry, and was part of a craft fair a couple of years ago every Friday night during the summer. There was live entertainment, and most weeks it was the same young man with the most amazing voice I have ever heard. He would repeatedly come over to my table and look at this one piece. One night I asked him why he kept looking at it. He told me his wife loved big jewelry pieces but they were newlyweds and he couldn’t afford to buy it for her, but he knew she would love it and wished he could. The summer passed and I never did sell the piece. I had signed up for his email newsletter, and could not help noticing how much he talked about his wife and how much he loved and adored her. When Christmas was 2 weeks away, I contacted him and told him I would love nothing more than for him to be able to give his wife the necklace for Christmas. Once again, he told me he couldn’t afford it…I told him I didn’t want him to pay for it…I wanted to give it to him. He argued but I wouldn’t take no for an answer. He finally agreed and we met up at the coffeehouse so I could give it to him. He had tears in his eyes when I gave it to him and he thanked me and hugged me repeatedly. Turns out, he gave it to her when he got home because he couldn’t wait for Christmas. I later received a beautiful photo of the two of them, and she was wearing the necklace and a very huge smile. Made me feel good! I have heard alot about making blankets for babies and chemo hats for Cancer patients but I have never made any for those reasons. Well a friend of mine in Florida mentioned one day on Facebook that she was going to meet with a group of ladies and they were going to make Chemo Hats for a Cancer Center there, will I live in Tennessee and knew that I could not meet with them but I asked if I could make some and mail them to her. She was very excited about me joining the group. She told me that their goal was to make 50, I made 8 and mailed them to her. We did reach our goal and a few more to spare. About 2 weeks after mailing them I received a card in the mail with a few of the ladies that received the hats on the front and they were wearing the hats. It really did humble me and I can’t wait for the next time that they make hats I will be the first one to sign up. As an adoption attorney, I recently helped a family adopt a two year old boy, whose mother abandoned him, on a pro bono basis. My daughter, who turned 15 today, and I also receive tremendous blessings from paying for the dinner of the person behind us in line whenever we go through a fast food place. At least once a month, we also get great joy visiting with and taking dinner to chemo patients who go to our church. My mother and I, whom I have been teaching to crochet, have been making blankets, hats and booties to donate. They will be going to the charity hospital and women’s clinic in New Orleans, in honor of my mothers’ childhood friend, who lost her twins at birth. It has been a wonderful way to bond with my mother, and connect through something gratifying and worthwhile! When I saw a posting on my FaceBook page about “paying it forward” I jumped at the chance. I absolutely loved that movie and the principle behind it. I crochet a warm scarf for the person who responded to my offer to “pay it forward”. An act of kindness involving myself and 5 other ladies who crochet and knit prayer shawls for those who could use comfort, prayers, and the knowledge of God’s love. We meet at the Zion Lutheran Church in Newton, KS for our meetings twice a month. I recently crocheted a hat and donated it to a cancer patient. I helped my neighbors shovel out the snow around their stuck car and in their driveway. In the past two weeks we’ve had more than two feet of snow – we don’t usually get that much in an entire winter. With the help of my boss, we also cleared the street – with snow shovels – so they would not get stuck again. I have been crocheting with a group from my church for the past year. Everything I have made has been given to someone else. I have made shawls for injured marines, lapghans for an abused women’s shelter, preemie blankets for triples in NICU, lapghans for cancer patients and much, much more. I would love to have this book in order to learn more unique stitches. While it always feels good to the soul and is a blessing itself to do an act of kindness the one that comes to mind first is….. There is an older woman in our church that we knew was struggling to make ends meet. When she was not paying attention we slipped some money in her purse. I have a story that involves some unexpected occurences in one day. My daughters and I usually take my grandkids to the crafts fair we have in our town as a yearly outing. The first thing that happened that required my attention was a lady was having trouble with her elderly relative and I just happened to be there at that moment to assist. On our way out of the park, I noticed a woman in a motorized wheelchair who had gotten stuck in a rut. This woman was a very large woman and her daughter had just realized she was stuck. The little granddaughter was distraught that her granny was in trouble. When I realized she was in trouble I ran to her aid and the daughter and I tried to figure a way to get her out of the rut. The only thing we could do was lift her out of her seat, I would say she weighed over 300 lbs. So her daughter got in front and I got in the back and by that time, more people came to assist us. I know the woman was embarrassed but I told her not to worry, anyone could get stuck in that rut! After we were able to get her standing(she couldn’t stand for but a minute or so) we maneuvered her electric wheelchair up on flat surface and had her walk a few steps to get back in. I feel God placed me where I needed to be that day. My grandson who is 9 told his mother he wanted to buy me a plaque. It said “God loves my grandmother and so do I”! What a wonderful day and being at the right place at the right time sure helped! Both my daughters said, wow mom, it was like you were supposed to be here today just to help those people. Lessons of giving taught without saying a word. Just yesterday while shopping at our local grocery store, I was looking for some sour cream. The store was having a special sale; Buy one, get one free. Hiding behind the Fat free variety was just one tub of the regular. As I pulled out and was looking for another, I heard a voice say, “Where on earth did you find that?” Looking around, I saw a tiny elderly lady, in full make-up, holding the twin to my sour cream. After telling her I had found it in the dark recesses of the back of the shelf, with her lip quivering, she proceeded to tell me that she had checked with the stock-boy and there was no more. We were at a stand-off. She had one and I, the other. Realizing that there would be no winners if we both kept our own, I handed over mine to her. The look on her face was sheer amazement! When I handed her a $1 off coupon for that brand, I knew that I had won, not the great buy but the knowledge that I made someone else’s day! Every year I donate more then half of my store items to people in need. Thank you and God bless. My aunt was diagnosed with cancer. I watched her struggle with being in a wheelchair after surgery, trying to get her coat on and off, and getting her blankets stuff in her wheels at home when she was cold. I whipped up a wrap designed to be nice and warm, but short enough that it didn’t touch the wheels of the chair, and no sleeves to have to try to get into, and surprised her with it. Its nice to make someone’s day when something as big as cancer is keeping them down. In Dec of 2009 I headed up an old fashion baked bean supper and raffle. I asked an old friend to help and together we were able to help a dear,dear man, friend coworker, husband and father know just how important he was to us and our community. We were losing him to cancer and he was the type of guy that rather give then receive, so this huge turn out of love totally overwhelmed him. It will be a year in a few weeks that he lost his battle but he left truly knowing how much we all loved him and I am so honored to have been able to do that for him. The whole experience was really a life long wish of mine, I too like to give then receive. I crochet preemie & newborn hats for the local NICU, I know there are never enough of those to go around. I have continued taking my old neighbor to Knit Night once or twice a month, even though I have moved away from her and have to drive 16 miles out of my way. Going to be with friends gives us both a good kick in the pants — helps to keep life worth living! I volunteer with inner city underprivileged kids and for Christmas I made them (30) hats and scarves. They all loved them and I loved making them for them.